When Ella Shohat’s doctoral dissertation was first published as a book in 1989, it stood out as a groundbreaking and insightful analysis of the Israeli cinema. 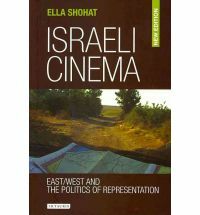 At a time when film criticism in Israel have failed to go beyond the context of the myths, ordinary film reviews, mostly coated with “ethnocentric prejudice” and therefore misjudged the active role of a national cinema that came into being simultaneously with the Zionist nationalism, Shohat’s work provides readers with an interdisciplinary, politically stimulating, critical account of Israeli filmmaking. Israeli Cinema structures itself around the unavoidable and integral realities of the land and its challenging history, where two nationalisms have continued to clash. Politics and dichotomies like East/West, Third World/First World, and the conflict, regardless of films’ commercial and political intentions, would pronounce themselves within the fabric of the story and the characters, as it does in the Israeli society. Shohat’s bidirectional take on a “Third World approach” amends the convenient indolence such binarism may pull you in, offers a profound demonstration of how they blend into each other and define themselves within the world of film, allowing the reader to appreciate the tools of film criticism as they unfold the screaming silence of the disregarded, the trivialized conflicts between Jewish ethnicities and how such representations, along with the politics, changes over time. The book is divided into five chapters, first of which delves deeply enough into the cinema practices long before the foundation of the State, at the start of the Zionist Yishuv. The Sabra becomes everything the New Jew represents. Surrounded by the temptation to “making the desert bloom” so that every Jew can pleasantly sit “under his fig tree”, the film practices find themselves in an atmosphere where they were highly dependent on Zionist institutions. In this chapter, Shohat’s analysis proves instrumental in exposing the demonstration of disregarding the presence of a native, majority Arab population, leaving them merely an element of the natural mise-en-scène. This practice is less naïve and more calculated than the early settlers who falsely misjudged the situation in this so-called empty country. The political and social atmosphere would dramatically change with the horrific consequences of the Second World War, and the foundation of the state of Israel. Chapter two examines this post-1948 era when the Israeli cinema basically focused on the “mythic Israeli heroes.” The study at this point stresses the self-representation of being Jewish in Israel and in the middle of the Arab-Israeli conflict, while the representation of the enemy figure, the Arab, stays anonymous, without his own story, distant enough to avert identification. In this chapter, the evil and the “good Arab” character in the “Zionist-Israel fiction” are closely analyzed from a “classically unequal First World/Third World encounter”, constituting an original dualistic East/West representation that prepares the ground for the next chapter where Shohat elaborates on the representation of the Oriental Jews in the post 1967 Israel. Their victory over several Arab states consolidates the national arrogance and the confidence on military power. This allowed very little room for identities other than the precarious Arab and the Jew. Therefore the Oriental Jewish characters in cinema, as the book’s next chapter significantly examines, is structured in a way that resembles the “First World attitude toward the Third World.” In the wake of the war, it was already difficult to attend to complex identities. As an Arab Jew, Shohat’s brilliant analysis, from a critical standpoint, of the underrepresented Oriental Jews discloses and studies the condescending attitude of the Western point of view toward the Oriental Sephardic / Mizrahi. In the last two chapters, Shohat examines the more personal films of the 60s and 70s, making intelligent references to the previous sections, along with carefully picked motifs which she processes frame frame, and carries them over into the realm of politics. The book ends with an extensive discussion of the emergence of a wave of filmmakers that placed themselves at the polar opposite of mainstream Israeli cinema. It successfully attempts to inquire the making of the films and their evolving characters alongside the mostly disadvantageous conditions of, and changes and developments within the film industry. The personal cinema and the cinema of the late 70s exposes the sense of isolation, the questioning of the Jewish identity and self-image within the internationally isolated Israeli society. The dissatisfaction with political forces and the state politics, everlasting wars generate political tension, oppositional movements and opposing artistic practices. During late 70s and more so in the 80s the Palestinian entity, the issues of the Arab-Israel conflict, is included for the first time in this manner in cinematic narration. The new edition is very timely with regards to the historical developments in the region, as well as in Israel and Palestine. With a comprehensive postscript, the author welcomes her readers with 20 more years of academic and personal experience, exploration, and thorough and mature discussion of her own book, as well as the new Israeli cinema that goes with the more complex and multicultural socio-political atmosphere. This is also a very accurate reflection of the complex voices in the country and the inclusion of the Arab voice within and outside of the Israeli society. Therefore the book is still a considerable addition not just to the film studies, but also to the general literature of Middle Eastern Studies, and Arab-Israeli conflict.